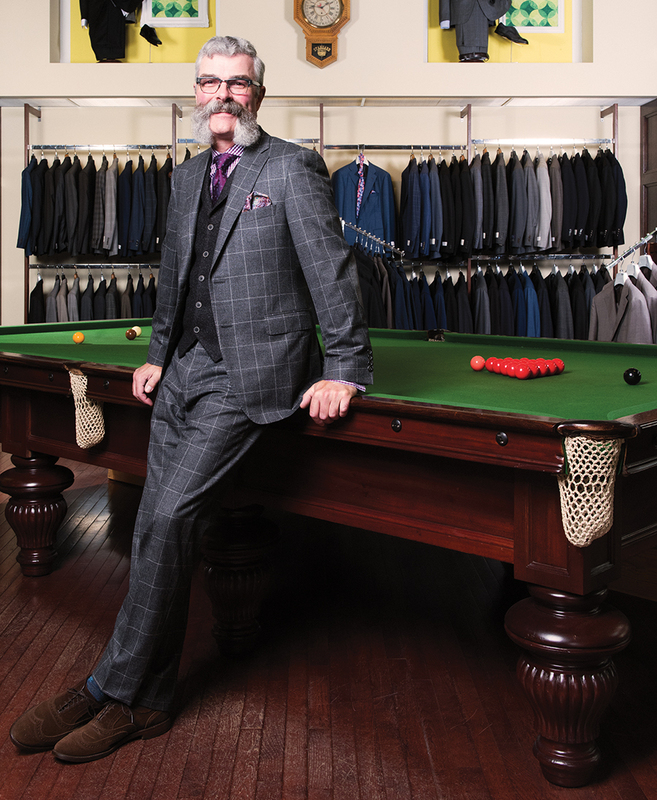 Eddie’s Men’s Wear has been bringing Edmontonians high quality garments for 60 years. The moment you walk into Eddie’s Men’s Wear, you spot a display case that shows ledgers and documents from the shop’s past, giving you an immediate sense of the business’s 60-year history. Upon walking around, you can see the focus on Canadian made merchandise, and the range of products available. And, at the centre of it all is Earl Klapstein. With his distinctive moustache and well-cut suit, Earl Klapstein navigates the store as though he’s been there in his entire life, which isn’t too far from the truth – he started working with his father, Eddie Klapstein, as a teenager back in 1974, although he had been helping out from time to time before then. “The early years, we lived together, drove together, worked together, it didn’t work too well,” he says with a chuckle. Whatever their disagreements were on the drive home in Eddie’s Volkswagen Rabbit Diesel, though, Earl admits that his father allowed him a surprising amount of autonomy at the store. “Most of the fathers that had sons in the business, the father was the iron fist, you had to put in your time and learn, whereas dad was one of those guys who said, try that, do this… he was willing to let me learn and stretch.” Though Eddie Klapstein passed away in 2014, the name remains and will never change. “As far as I’m concerned, we’ve got the history built with Eddie’s, why would we change that?” he says. Though Eddie’s has grown over the years, it has never wavered from its core values, including a prioritization of relationships, with customers, suppliers and staff. Some relationships, with return customers and suppliers, have spanned decades and crossed generations. Earl recently found ledgers that prove he has third- and fourth generation clients. Earl and his father were both the stars of a variety of postcards that were sent out to Eddie’s clients over the years as another way to engage with them on a more personal level – there’s a book of postcards tucked away that a customer put together after saving many years’ worth. And, while Earl now has decades of experience, he makes it a priority to ensure his staff feels their voices are heard. They always have the opportunity to put in their two cents about what the store is ordering for the season, to champion particular swatches they feel strongly about, so that they feel a connection to the products on the store floor. “I say this to people all the time, it’s not as much a business as it is a family,” says Earl. “When people walk in the front door, we didn’t go concrete, we didn’t go glitzy, we wanted it to have a homey feel, something warm. Someplace you walk in and feel like, ahh, this is more like it.